When will be The Teenage Psychic next episode air date? Is The Teenage Psychic renewed or cancelled? Where to countdown The Teenage Psychic air dates? Is The Teenage Psychic worth watching? 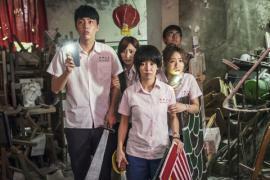 The Teenage Psychic follows Xiao Zhen, a 16-year-old girl born with the ability to see spirits. As Xiao Zhen uses her power to help the living deal with their loved ones on the other side, she must also juggle the pressures of teenage life with the demands of the spirit world. The relationship between Xiao Zhen and Ah Le deepens after Ah Le confides in her about his father's absence and disappearance. Fearing that his father is dead, Ah Le requests for divine help from Xiao Zhen but in her over eagerness to cheer him up, Xiao Zhen takes things a little too far. At the same time, Teacher Kim enlists Xiao Zhen's help to assist a powerful politician running for office. Alice sends Xiao Zhen a pair of tickets to her comeback concert, and Xiao Zhen and Ah Le arrange to go together as their first date. Her obligations to the temple get in the way of their date as Xiao Zhen is forced to make a trip back to appease Politician Zhao, who has brought his sick wife to the temple in hopes of a miracle. The Teenage Psychic next episode air date provides TVMaze for you. EpisoDate.com is your TV show guide to Countdown The Teenage Psychic Episode Air Dates and to stay in touch with The Teenage Psychic next episode Air Date and your others favorite TV Shows. Add the shows you like to a "Watchlist" and let the site take it from there.